Networking titan Cisco is adding both NVMe over Fibre Channel and 32Gbit/s Fibre Channel speed to its MDS Director and UCS C-Series server products. Fibre Channel speeds are doubling from 16Gbit/s to 32Gbit/s, what Brocade calls Gen 6 Fibre Channel. That company launched its 32Gbit/s Director product last July – a Director being the largest kind of SAN access switch. Brocade, Atto and QLogic announced 32Gbit/s host bus adapters(HBAs) in March last year. Now Cisco has announced a 32Gbit/s switching module for its 9700 MDS Director product, the MDS 9700 48-port 32-Gbit/s Fibre Channel Switching Module to give it its full name. These modules have a built-in hardware-based analytics engine which registers every exchange, sequence, and packet at line rate, which Cisco claims enables real-time analytics of performance issues. The 9700 can have up to 768 line-rate 32Gbit/s Fibre Channel ports, with full-duplex aggregate performance of 1,536 Gbit/s (1.536 Tbit/s). Cisco says this means it works well with high-performance virtualized servers, all-flash arrays and non-volatile memory express (NVMe) arrays. Handy, as Pure Storage has one of these coming out. 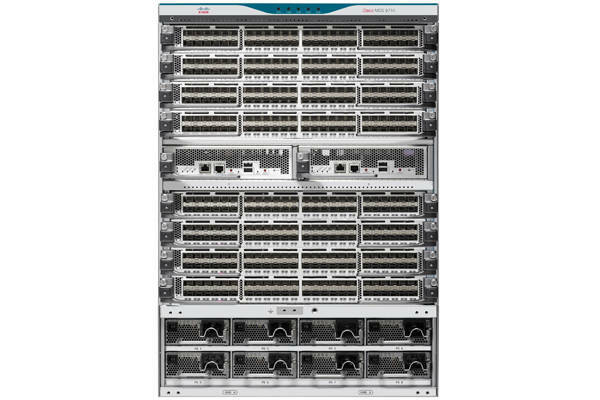 Cisco’s uprated director can work with 32Gbit/s Broadcom/Emulex and Cavium/Qlogic Fibre Channel HBAs fitted to accessing servers, such as Cisco’s own UCS C-Series ones, to provide an end-to-end 32Gbit/s Fibre Channel fabric. The MDS storage director and UCS C-Series server also now support NVMe over Fibre Channel, with the Fibre Channel being the wire over which the NVMe protocol is carried, thus providing low latency PCIe card-speed access to the SAN’s data. For existing Fibre Channel-accessed SAN users, the opportunity to enjoy low latency NVMe access without needing to add a Ethernet or InfiniBand network to carry the RDMA traffic looks, in theory, like a no-brainer upgrade, if they need that level of data access speed. With virtually every all-flash array supplier adding or promising to add NVMe over fabrics support to their arrays then this NVMe over Fibre Channel capability means that the networking link with existing SANs will be ready for them. NVMe over fabrics is supported on all current and future generations of MDS switches, including MDS 9700, 9396S, 9250i and 9148S. The NVMe support on these switches doesn’t need hardware changes, coming with a non-disruptive upgrade to NX-OS version 8.x. Both the MDS 9700 and UCS C-Series products support NVMe and SCSI simultaneously over Fibre Channel and FCoE (Fibre Channel over Ethernet). Find out more about MDS directors here. You can read a blog from J Metz, senior product manager in Cisco's Data Center Group, on NVME and NVMe over Fabrics here. SAN gang at Nimble jump in Fibre Channel pool, but how big will the splash be?